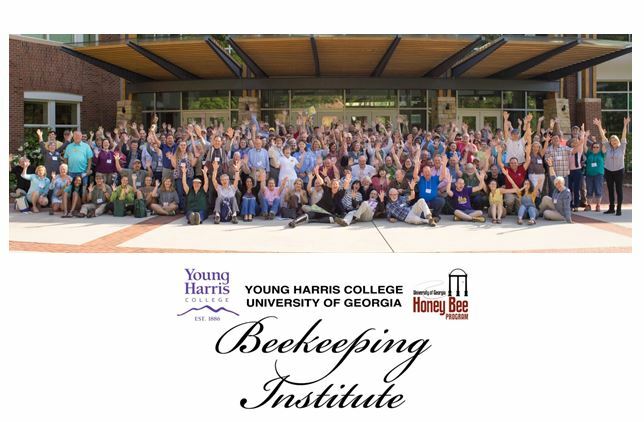 We’ve chosen a lot of really cool plants to see what works for our bees this year. On some of them, we did a lot of research, while others were just speculation that they might work as a good pollen or nectar source. Some were just really pretty and I’m hoping the bees like them. As with most research endeavors, if there’s a book about it, I’ve got an excuse to add to the library. In this case, I found a really cool series of books that have titles starting with “The Plant Lover’s Guide to _______” and each book covers a different plant group. The reason I found it was because I was looking for information on salvia, and lo and behold! There’s a guide to salvias! Earlier in the year, I mentioned the blue pollen garden we were trying to grow. It sort of turned into a “hey that’s blue, let’s try it” thing. I’ve learned in my research that while a lot of plants have been cultivated to produce showier flowers at the expense of their nectaries, salvia has been able to maintain its nectar and pollen supply in sufficient levels to attract pollinators. 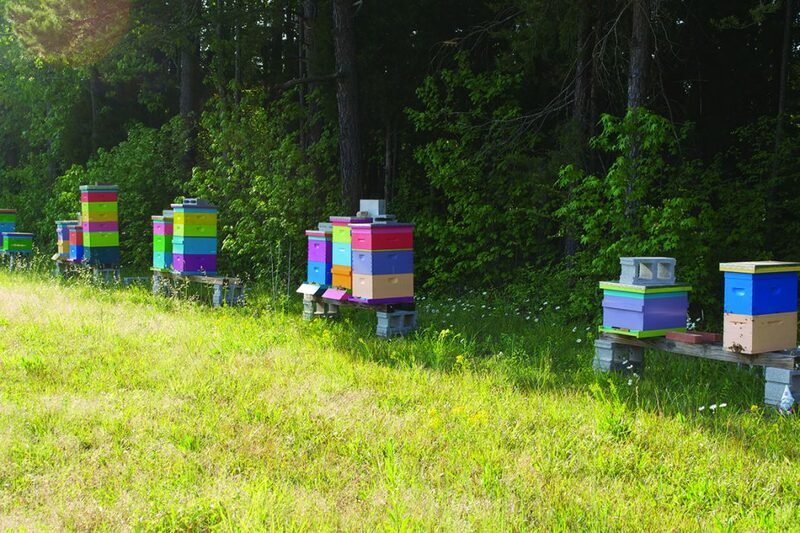 They are also modified based on their indigenous area to maintain a mutually beneficial relationship with their expected pollinator. Old World (Europe/Asia based) salvias are adapted to bees, while New World (Americas) salvias are more adapted to hummingbirds. They have something really cool called a stamina lever mechanism, which is similar to the trigger in alfalfa. It basically causes the pollinator to get bopped in the head or the back with the stamen to move pollen to the next flower. In a honey bee’s case, they usually only visit to collect nectar, but will take pollen after the trigger has been activated by a pollinator that doesn’t mind getting the head bop. 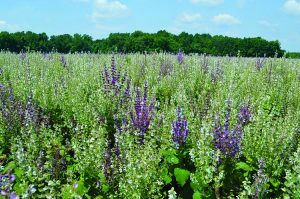 Salvia has emerged as a little less harsh than the trigger in alfalfa, with more of a gentle brushing of the anthers in an unavoidable area that will neatly end up on the pistil of the next visited flower. This lever mechanism is not specific to honey bees, and is sort of a “generic” version that also works on other bees as well as hummingbirds. Once the pollinator leaves the flower, the stamen will go back to their original position. Getting into a little botany, we will follow the ancestry of salvia. If we skip along the branches of botanical naming, we see the family for salvia is Lamiaceae, the mint family. The Salvia genus is the largest group in the family, and all salvia species have the characteristic square stems, opposite leaves, and bilateral symmetry that all the species in the mint family share (like bee balm). One difference here is that there are only two stamen instead of the characteristic mint family four. There are hundreds of species and varieties available for purchase as well as wild growing, and adapted to nearly every climate that is even mildly hospitable to plant life. Most are not particularly cold tolerant, but can be drought tolerant. They can also be called by various names. In general, a species used for culinary or medicinal purposes is referred to as “sage”, while an ornamental version is usually called “salvia”. Medicinally, salvia is known for improving digestion, antioxidants, and helping with mood and brain function. When I started buying seeds, I immediately fell in love with one particular species of salvia on Johnny’s Seeds website. The Victoria Blue salvia, Salvia farinacea, is a gorgeous deep blue color, drought and heat tolerant, and can survive in poor soil. Another purchase (because how could you just by one packet of seeds? I mean, isn’t that a waste of shipping?) in this order was Salvia elegans, which is purported to smell like pineapple when you crush the leaves and has fruity tasting flowers that are good in salads. 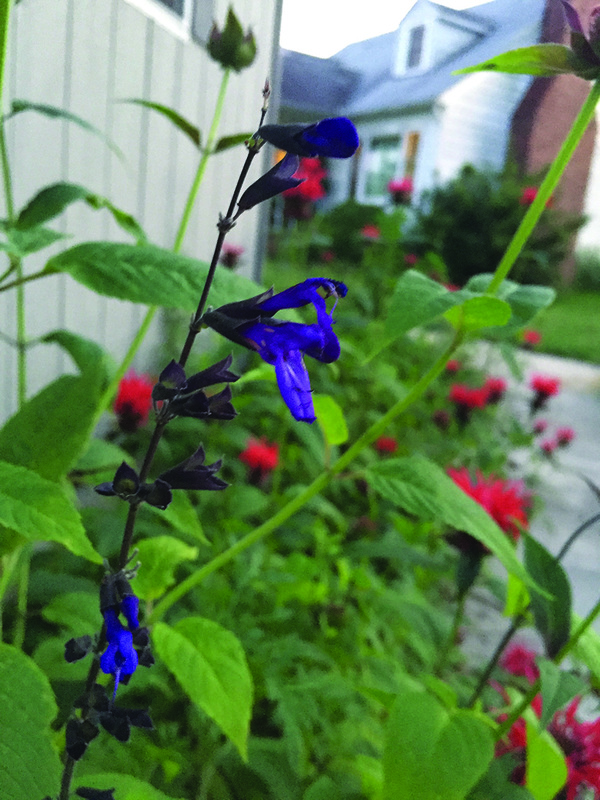 There was also Salvia viridis, a mixed pot of vividly colored flowers that are also mildly sweet and perfectly edible, and also used in flavoring beer and wine. I had to buy some Salvia officinalis because hey, it’s not the real deal until it has “official” in its name, but we do have it growing wild here, or at least some variation thereof. A field of clary sage being used as a backyard. 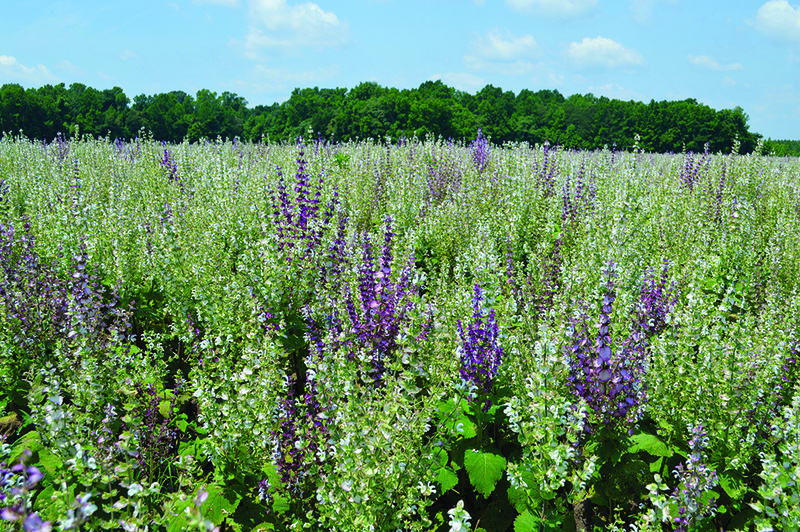 A field of clary sage in easter NC. highway (or my rage at inconsiderate drivers swerving towards my trailer impacted my ability to focus on such things). You could definitely smell it, but it smells a lot like cat pee and flowers to me. Not just regular cat pee, but when your cat gets mad at you and pees in your shoe (just one of them) and you don’t know until you wear them a week later and can’t figure out why this dirty cat pee smell is following you. 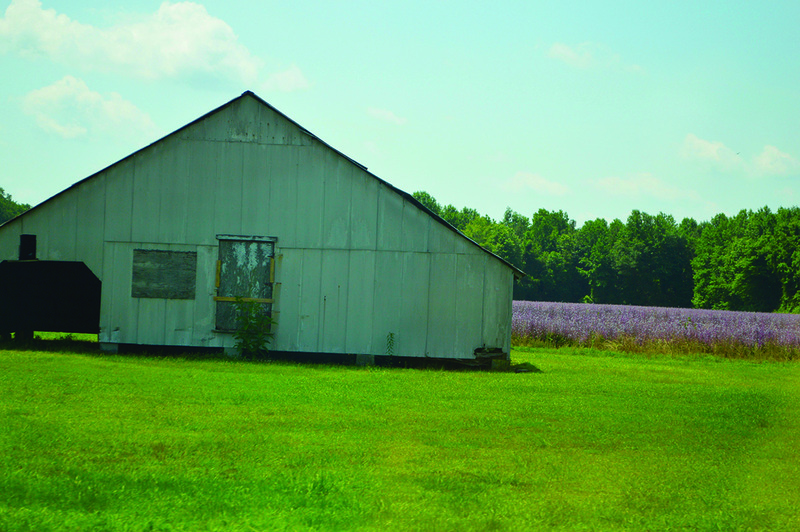 We probably passed over 50 acres of clary sage in about 10 miles. Besides the clary sage, I decided to spice things up with scarlet sage, which is Salvia coccinea. “Coccinea” comes from the Greek word “kakkos” which was used to describe red foliage from oaks in the fall. Now, it is used as the species name for almost any scarlet-hued plant. In some cases, I suppose it also relates to animals, such as cochineal scale insect that produces carmine (the “natural” red dye in food). Because we’re shooting to follow the blue theme, the Salvia pratensis was the next purchase since it was blue, but by the description, it appeared to be more attractive to pollinators while also needing more attention than the others so far. It had to be deadheaded like petunias to keep bloom progression throughout the Summer. 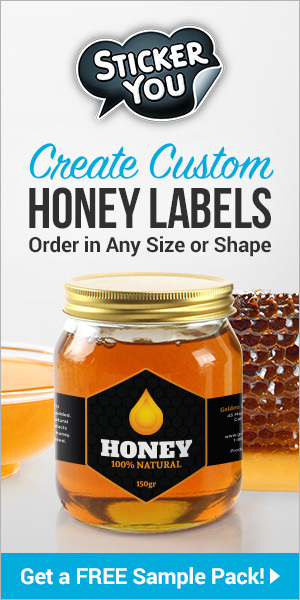 If you are interested in adding some easy to grow plant life to your yard that is bee attractive, there are some immense choices here with sage. I would definitely recommend the Salvias guide, as well as some general botanical research to see what is best in your area. The Plant Lover’s Guide to Salvias also has a whole section on different species and their suitability to different areas. 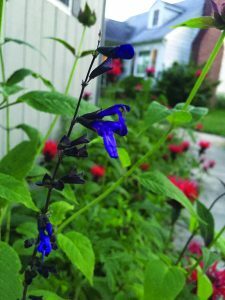 It also includes lists for what salvias are best in different kinds of gardens, such as rock gardens, container gardening, borders, and even attracting pollinators! One bee attractive sage was Salvia mellifera, which would immediately indicate a correlation with honey bees! On a weird note, it’s called Black Sage but the flowers are white, and it pretty much only grows in southern California. Otherwise, there are gorgeous photos of all the species listed in the book, as well as hardiness, origin, cultivation, and landscape use for each one. Indigo salvia with our bee balm. I have to say that I’ve learned a lot with my salvia searching. For instance, I didn’t realize that the little purple flowers that pop up in patches around the yard and our field were salvia. I knew they were “minty” because of the square stems (pretty hard to ignore as a common characteristic), but I never took the time to think about what they were. We also grow Indigo Spires salvia in a small bed with scarlet bee balm, and somehow it never occurred to me that they were practically cousins until looking this up. Something that was more of an observation was that one of the pictures in the book shows a bee with pollen baskets that has a caption about the bee getting nectar, which is obviously not true since it has pollen baskets. This is really cool though because it shows a propensity to collect pollen (it was not blue pollen, FYI) from plants with a lever mechanism. Overall, I think these will be some really cool plants to add to your garden. They grow fast, produce for an extended season, offer bright colors, and are attractive for multiple pollinators. They can last for years with a lot of care, or they can last for a few years if you ignore them like I plan to do. If you change your mind a lot about what you like, then you can just till them back in for nitrogen (and a temporary pleasant smell, if you like it). There’re multiple medicinal uses for sage if you’re interested, or you can just admire them from afar post-planting. These plants offer multiple benefits with a pretty low input on the gardener’s end, and would be a great addition to any home!